If you had asked me, this glass block goodness that is our master bathroom would have been the last bathroom in our house we touched. Why? Well, it was fully functional and in the master bedroom, so really didn't affect anyone except Ian and I. Never mind the fact that apparently slate is the WORST thing in the world to clean. I scrubbed and scrubbed, tried various products and nothing would clean it. Come to find out, that's how slate is. But no one except Ian or I saw it, so it wasn't the end of the world. Enter November. I was cleaning the kids playroom one day in November when I noticed a leak. Whomp, whomp, whomp. We called a plumber. He wanted to rip into all the walls to find out the problem. Awesome. But it was a Friday afternoon and he didn't have time. The next week another plumber from the same company came out. This guy was awesome. In fact, he was the same guy that came out to our last house when our lawn was covered in poo. So basically, he's seen me through some dark times, haha! Anyway, he didn't want to rip into walls, but instead take time to measure, look in crawl spaces, etc to figure out the problem. And the problem ended up being that glass block goodness of a shower. Now here's the thing, the shower could be fixed without redoing the whole bathroom. BUT, they were going to have to tear out the entire glass block wall, the floor of the shower and three feet up the shower wall. A new shower was no brainer. And, well, the floor of the bathroom should match the shower. And now that we are at it, the existing vanity wouldn't match the tile we picked out. And it just keeps going and going and going. Picking out tile has been, well, a process. I never knew I had expensive taste until every sample I touched at the tile store was like five times the price of our budget. Then there's trying to find tiles that go together. One's that aren't to matchy matchy, but complement each other well. Let's not forget people's opinions. Those were enough for me to cover my ears and hum. So.much.advice. In the end, we went with what we liked. White subway tile with dark grout for the walls and large almost black hexagon tiles with dark grot for the floor. We still have to figure out some of the other details, but at least the big choices have been made. So today I sit here, listening to them rip out my entire bathroom, down to the studs. There may even be a possibility of expanding the bathroom, but we are playing that one by ear...though it would be awesome if it works out. In the mean time, I am over here feeling nervous that I fully like the choices we are making, because a whole new bathroom is quite pricy and I am stuck with it either way! Given we live in a 1939 tutor style house, I wanted something that went with the style of the house, was bright and clean (our last bathroom was a bit of a cave) and something that wouldn't be out of style next week. 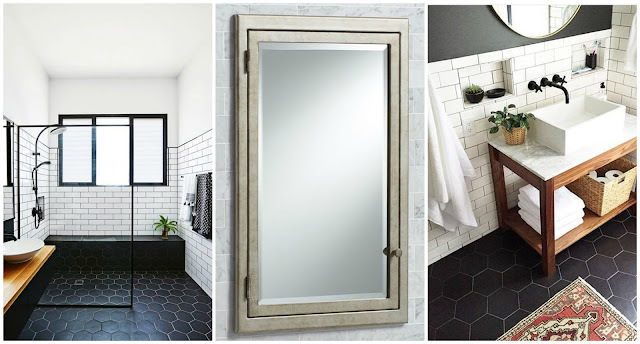 So here's some of my inspiration for our bathroom. One thing I know for sure is my bathroom has to be functional. I saw so many amazing bathrooms on pinterest with zero storage, or cute sinks that are totally not practical for everyday. And since our bathroom is small, it has to pack a punch. We have to have enough storage for our everyday essentials, not to mention room to move. With five of us currently sharing one bathroom, I now know the importance of space and storage first hand!